6 Days, 40 Bands, 5 Mountains & 1 Really Cool Design. 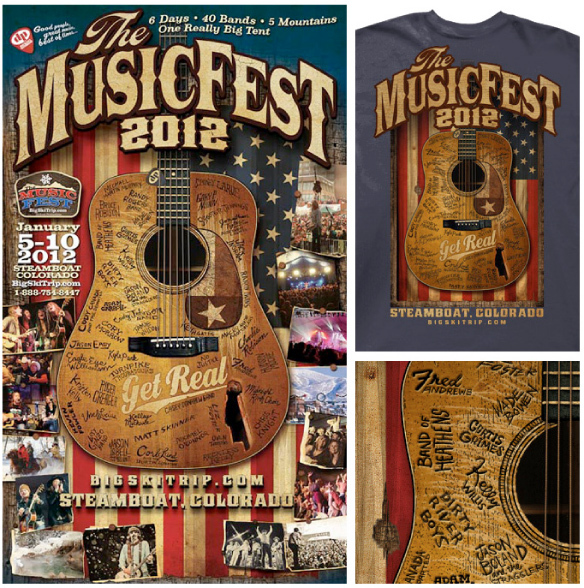 Does it really get any better than the MusicFest? Now in its 27th year, the MusicFest draws thousands of ski-lovin', music-lovin' folks to the snow swept peaks of Colorado each January. The largest group ski trip of its kind in the nation, the MusicFest brings the finest Texas and Americana music to the world-class ski resort of Steamboat, Colorado for a week full of sport and song. Each year, Outhouse Designs works with Dickson Productions to create the official limited edition design and print materials. Our shirt was seen racing up and down the slopes, drinking at hole in the wall bars, and rocking out to the glorious strains of Texas and Americana tunes all over Steamboat. Good people, great music, and one popular tee shirt to commemorate it all made for an unforgettable “Get Real” experience.